Following on from our non-linear consideration of curriculum, we approached collaborative unit planning in a similarly holistic way, with the child at the centre, to ensure a focus on our goal of developing the whole child. Making thinking visible is an important part of the collaborative planning process. Considering all the elements simultaneously makes it easy to visualise the potential big picture. The visual process allows for collaborative construction of meaning. While always conceptual, some units are more knowledge based, others more skills based, and that’s ok! A holistic vision of the unit highlights opportunties for natural connections that strengthen learning. Opportunities are illuminated for split screen teaching (inquiring into content and developing skills & dispositions simultaneously). Standing around a table might trump sitting behind computers for collaborative thinking! Cross-posted at Inquire within, following on from Inquiry: to what end? by Cristina Milos. In a concept driven, inquiry based learning environment, we do NOT plan a series of activities to ensure coverage of the requirements of our national curriculum. Instead we spend our planning time reflecting collaboratively, exploring which conceptual lenses will produce the deepest learning and designing a few powerful provocations to generate student thinking and inquiry. The location of the major countries of the Asia region in relation to Australia and the geographical diversity within the region. Differences in the economic, demographic and social characteristics between countries across the world. The various connections Australia has with other countries and how these connections change people and places. The effects that people’s connections with, and proximity to, places throughout the world have on shaping their awareness and opinion of those places. We revisit the big ideas and consider which conceptual lenses will help our learners break down misconceptions and result in deeper learning. As we develop the rubric for conceptual understandings, we go back and forth, change our own and each others’ minds and realise that we need to change one of the concepts to better achieve the desired end. This part of the planning takes time, but it’s well worth the investment. Planning learning engagements will be simple once we know where we are heading and why. Using ‘reflection‘ (How do we know?) as one of our conceptual lenses will provide opportunities for our learners to reflect on preconceived generalisations and stereotypes. At the start of the unit of inquiry they will be able to say what they THINK they know about different countries and HOW they know. By the end, we hope they can explain how some of their preconceptions have changed as a result of acquiring new knowledge and developing understanding. With this big idea as the through-line, learners will have a clear sense of purpose, as they interact with people in other countries, find out more about the factors that influence how they live (causation) and explore how countries are interconnected (connection). They will have opportunities to focus on their own areas of interest, to question and wonder, read, view and talk to primary sources… all the while increasing their knowledge, deepening their understandings and making sure they go beyond stereotypes and generalisations. Both times, all hands go up, including mine and Jocelyn’s. I’m in her Year 6 class to help them consider the big ideas in their learning and develop their understanding of concepts. This will assist them to organise information in future, explore significant ideas, promote higher order thinking and deepen inquiry. They quickly get the idea that the big ideas we remember, long after we have forgotten the details, become the seeds from which new learning grows. What is a ‘big idea’? In considering what such ‘big ideas’ might look like, we talk about the fight Ellie had with her brother this morning. Ellie’s incident is specific to time, place and situation, but the children all have similar experiences to share. I ask if they think sibling rivalry exists in other countries and cultures and they say of course. Will it still exist in the future? Definitely. Did it exist long ago in the past? They have examples as far back as Cain and Abel! It is clear then that the ‘big idea’ of sibling rivalry is transferable, timeless and universal. Once they get the idea, they are quickly able to express the big ideas behind a range of topics they have explored in the past. They’re even able to grasp the Lyn Erickson ‘Structure of Knowledge’ diagram. I tell them I learned this at a workshop for teachers but I’m sure they will get it. I ask for a show of hands if anyone thinks kids are as smart as teachers. Lots of hands, some giggling. They do get it …and they give examples from their own learning. Yesterday Joc had them look at their class learning community through the lenses of the PYP key concepts. – Joc has succeeded in building a thoughtful learning community. Citizenship carries with it a sense of belonging or identity which includes rights and responsibilities, duties and privileges. Different decision-making strategies can be effective in different situations. In a democracy, citizens have a say in decision-making. The impact of decisions can be personal, local, global. – By the time they visit Canberra for their inquiry into government, they will have plenty of big ideas to which they can connect. Big Ideas in the classroom. Since I no longer have my own class, I relish opportunities to get into classrooms. This week I’m team teaching in Year 5 with Rubi… and team learning. We bounce ideas before class, observe and listen to the kids and change the plan as the learning unfolds. The ‘topic’ is energy, but it’s inquiry learning and it’s concept driven. The first provocation is a video showing the effects of an electricity blackout. The students’ questions are quite specific to the incident, and we realize we need to change the plan already. We ask the kids to revisit their questions and ‘grow’ them, this time considering big ideas, transferable through time and place. It only takes one example from a different context to get the idea and they are away! This round of questions is about electricity and alternative power sources, not just the blackout they saw. Rubi introduces a second provocation to further develop their thinking. She puts on music and asks the kids to dance and jump around. There is lots of noise and energetic movement, kids remove their sweaters as they warm up and a good time is had by all (except the class next door.) We ask the kids to discuss in groups how this activity connects to the first provocation and then come up with further questions. This round of questions is about different forms of energy, where they come from and how they are used. With each question on an individual sticky note, the groups sort the questions in any way they like. Before they start I ask them what they see as the purpose this activity. Mia says it will make them read everyone’s questions and think about them. Liam says it will help them organize their thoughts. Amanda says it will help them check their understanding. Josh says they will have to justify their thinking. Some groups sort the questions by topic, others by big ideas. One sorts them according to the PYP key concepts. Some groups sort and re-sort in different ways. Some sort them into deep and shallow questions, open and closed questions. I’ve seen Rubi encourage this this kind of thinking by having kids analyse questions through the question quadrant. They use the language: ‘That’s a closed question,’ ‘You could just google that,’ ‘ That’s too narrow, how do we make it a bigger idea’? ‘That’s just about facts, it’s not deep enough.’ We gather the questions, type the whole lot and cut them up, ready for sorting the next day. To sum up the lesson, we ask students to give it a title. I ask what a title does and they tell me ‘It sums up what’s important,’ ‘It tells you the main idea’, ‘It tells you what it’s all about’. ‘It makes you want to know more’. Their titles fit the bill! Each group now gets the whole class’s questions and the task is to sort the pile into two groups… Those that relate to the central idea (the overarching conceptual understanding.) and those that don’t. The students are totally engaged as we move between groups and listen to the rich conversation. There is much debate and it doesn’t take long before they decide they need three groups or even four, because it isn’t as simple as that! Through the process, questions are further developed and refined. The key concepts which will be our lens for the inquiry are function ( how does it work?) and responsibility. We ask the students to get the laptops and create a quick cartoon using Toondoo to show their understanding of one of the two concepts in a clever way. Some create cartoons that connect to our central idea, others show examples that connect to their personal lives. The choice is theirs – the results are creative and thought-provoking! Back in groups, the students now pick out questions relating to each of these key concepts…. Officially, there has been no teaching yet. A few video clips, some ideas on the class blog to think about and the time described above spent provoking and developing thinking. Students have risen above the facts and are thinking on a conceptual level. They are making connections with prior knowledge and constructing meaning for themselves. They are asking and answering questions, organizing ideas and justifying their thinking. The so-called ’21st century skills’ of creativity, critical thinking, communication and collaboration are all evident. A host of other trans-disciplinary skills are being practised. Curiosity has been sparked and there is excitement about taking the learning further. Every single one of our school’s learning principles is evident. Excellent resources on concept driven learning here. Our job is simply to create questions. We are each assigned a different lens through which to view the object and ask our questions. We are artists, mathematicians, scientists, inventors and historians. We are encouraged to frame our questions conceptually. 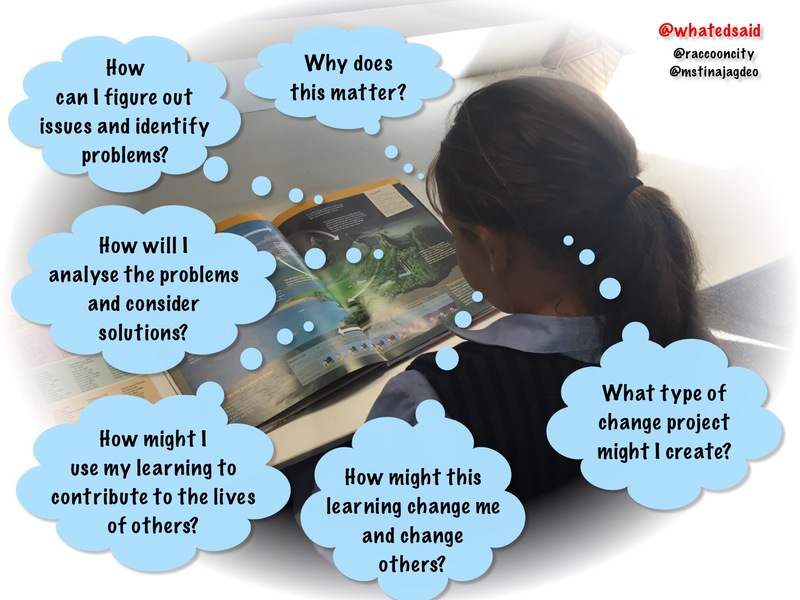 Considering the key concepts of form, function, causation, change, connection, perspective, reflection and responsibility (key concepts in the IB PYP) helps us to ask deeper and more interesting questions. We could approach the task in different ways – it was naturally differentiated. It was inquiry based, encouraging us to question, wonder and explore possibilities. We were honing our questioning skills, while constructing meaning about the object and its possibilities. There were no wrong answers (or questions) and it didn’t matter what the object really was, so everyone was happy to have a go. It was challenging and engaging and we saw at once how it could be used in our classrooms. There was valuable individual and shared reflection about the process itself. For me, the journey started when I read an extract from ‘Navigating through the Storm, Education in Postmodern Democratic Society’ by Ron Aviram, head of The Center for Futurism in Education, in Israel. Then I attended an IBO conference. It wasn’t so much the content, but the opportunity to network with educators from around the world and see the things that teachers have done in their classrooms and schools, that motivated me. The next step was to start implementing tech myself. I introduced my class to ToonDoo and Voicethread and Wallwisher to enhance their learning. We learned together. As I discovered new and useful tools, I shared them with my class and with other interested teachers at school. I set up a class wiki and before long every child had their own page and they were finding ways to share their learning through this medium. Next we started a voluntary tech group for interested teachers to experiment together every fortnight before school. Our ‘Thinking group‘ which meets on the alternate week had been sharing readings and implementing Visible Thinking and soon the 2 groups began to merge as a 21st century learning group. Discussions centered on making learning relevant and authentic, including incorporating technology. This is my in-school PLN. I joined nings, such as Classroom 2.0 and Educators PLN and PYP Threads and began to participate. The next step was when a friend encouraged me to start writing my own blog. At first I didn’t think I had anything to say. Then I didn’t think I would have any readers. But I pushed forward and was soon addicted. I had more things to write than time to write them. I didn’t care if I had an audience or not, the process was part of my own learning. My early readers were my colleagues at my own school and I saw them as my target audience. And then, by far the best thing happened.. . I had dabbled in Twitter but not yet seen the point. But,once I figured out the benefits of following educators and discovered the #edchat hashtag, I was on the road to the best learning yet! I have developed an amazing worldwide PLN. I think I have discovered and uncovered more through Twitter than any other way. Interacting with educators worldwide and sharing resources in this way has been my most powerful learning experience this year. And finally (only so far!) I have joined Kelly Tenkely’s blogging alliance. I have discovered some excellent blogs this way and connected with other educators through commenting on each others’ blogposts. This has turned out to be another great way to network and has opened yet another channel for learning and collaboration. 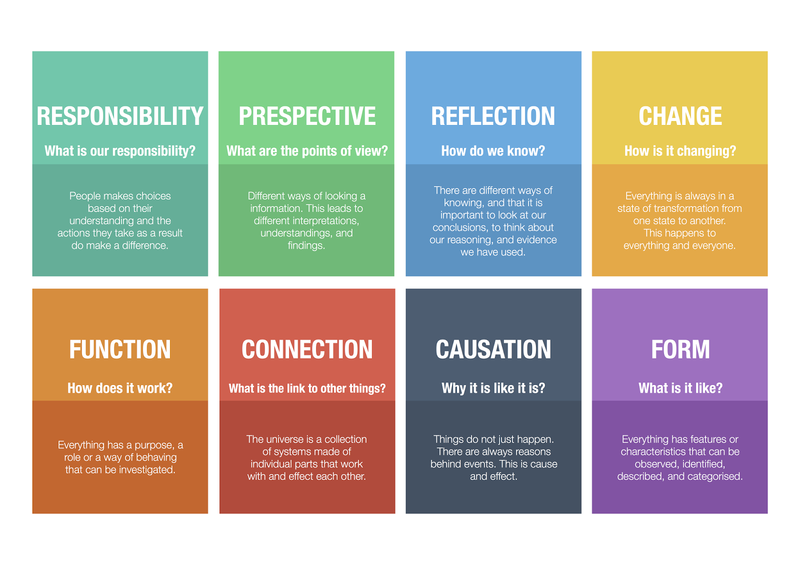 PYP Key Concept: Reflection. Series of posts through the lens of key concepts of PYP. Posts relating to other key concepts: Form, Change, Connection, Perspective, Responsibility, Function.